Pericles was the leading statesman of Athens and brought it to the height of its political power and artistic achievement. The years from 446 to 429 B.C.E. have been called the Periclean Age. Pericles was the son of Xanthippus, a statesman and general of an upper class family (probably the Bouzygae), and Agariste, a niece of the famous statesman Cleisthenes, the leader of a powerful clan, the Alcmeonidae. Pericles inherited great wealth; as a young man, he put up the money for the costly production of Aeschylus's play The Persae in 472 B.C.E. Pericles received the best education available, studying music under Damon and mathematics under Zeno of Elea. His greatest influence was a scholar named Anaxagoras, who taught him how to make speeches and was a model of the calm style that Pericles would use in politics. In his pursuit of a public career, Pericles chose to speak out in favor of a more advanced democracy. Pericles became prominent in the Assembly, where he called for constitutional reform. He worked closely with Ephialtes, an older and more established leader of democratic views. They were both elected generals sometime before 462. In 462–461 they decided to attack Cimon, a leading conservative (one who believes in maintaining things as they are) and the most powerful of the generals in office, by accusing him of bribery. However, he was cleared of the charges. Later, Sparta's appeals to Athens for help against an uprising there were granted on the advice of Cimon and against the advice of Ephialtes. When the Athenian army under Cimon's command arrived to help, Spartan leaders changed their minds and dismissed them. This insulting treatment enraged the people of Athens and disgraced Cimon. While Cimon and the army were off to help Sparta in 462, Ephialtes and Pericles carried out their extreme democratic reforms, stripping the Areopagus Council of all constitutional powers and making the authority of the Assembly and the Heliaea (people's courts) absolute. Athens also made alliances with Sparta's enemies, Argos and Thessaly. At this time Ephialtes was assassinated, and Pericles became the undisputed leader of Athens. Pericles passed further legislation to weaken the Areopagus Council, introduced pay for political services, and restricted Athenian citizenship to children whose mothers and fathers were both Athenian. He also changed the Delian League, a collection of city-states bound together with Athens to stand against Persia, into an Athenian Empire. He collected annual payments from the member states to maintain a fleet of ships, and the money left over was used to improve Athens. Pericles oversaw the construction of many famous and beautiful temples and public buildings in Athens, including the Parthenon. 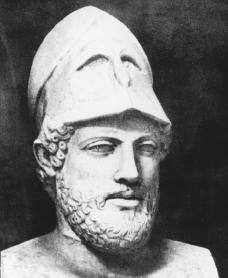 Pericles eventually proposed the recall of Cimon, which resulted in victories over Persia and a truce with Sparta. Pericles's own operations as a military commander in western waters in 455 and 454 were successful. However, it is not known how much Pericles was involved with later wars fought on two fronts—against Sparta in Greece (resulting in neither side winning) and against Persia in Egypt (which resulted in a heavy defeat). Pericles's actions on behalf of the Athenian Empire led to increased problems with Sparta. In 447–446 the storm broke within the empire, with many regions rising up: Athens's power in Boeotia collapsed, Euboea revolted, Megara broke free from Athenian occupation, and Sparta invaded Attica. Leading an Athenian army, Pericles crossed to Euboea and then rushed back to face the enemy in Attica. To everyone's amazement the Spartan king withdrew his army. Pericles was said by some to have bribed the king. Pericles hurried back to Euboea and stamped out the revolt. A peace treaty was achieved, but Athens had lost most of its gains. Pericles's foreign policy was to stop any revolt in the Athenian Empire and to resist Sparta. He paraded the naval power of Athens with an expedition in the Black Sea (c. 437), and he advised Athens to make alliances with Corcyra (Corfu), a leading naval power in the west, in 433. A series of incidents followed that resulted in war with Sparta and its allies in 431. Pericles's strategy was an offensive by sea, avoidance of battle on land, and control of the empire. Inside the walls of Athens, an outbreak of disease struck down a third of Athens's armed forces, two sons of Pericles among them. The people of Athens began to turn against him for the first time. He was fined but reelected general in 429 before dying later that year. The society he led followed his ideas—a love of Athens, a belief in freedom for Athenians, and a faith in the ability of man. Kagan, Donald. Pericles of Athens and the Birth of Democracy. New York: Free Press, 1991. Poulton, Michael. Pericles and the Ancient Greeks. Austin, TX: Raintree/Steck-Vaughn, 1997. Skeele, David, ed. Pericles: Critical Essays. New York: Garland, 2000.